NGK Spark Plug Wires - Racing Cable UNIVERSAL - Pann Auto Performance - San Diego largest aftermarket automotive performance parts - What do you drive? 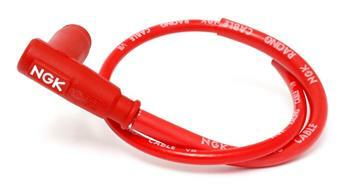 NGK Racing Cables are designed for the serious racing enthusiast. Low resistant racing cables improve sparking energy leading to improved engine performance. Durable in construction NGK Racing Cables feature high temperature silicone outer jackets, solid copper wire strand core and high temperature resistor covers. Resistor Covers come equipped with 5 k ohm ceramic resistors to help in the reduction of “Electro Magnetic Interference” and “Radio Frequency Interference” which can interfere with electronic ignition components causing misfires and poor engine performance. 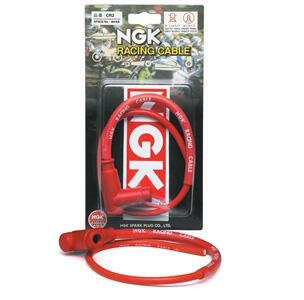 NGK Racing Cables are available in straight or 90 degree resistor cover configurations and are available for both removable terminal nut and solid terminal nut spark plug designs. Offered in two lengths 50 cm and 100 cm these universal cables are designed to fit most Motorcycle, Marine, Snowmobile and Shifter Kart applications. Depend on NGK Racing Cables to fire your way to victory.